Regardless of whether your reaction is an indifferent shrug to the almost-daily news reports of billions of dollars wasted every year in unused and under-performing software due to flawed IT selection and procurement practices, or whether you spend sleepless nights worrying about the incessant security and compliance issues posed by rogue software purchases across your organization, agile technology selection practices are starting to gain a foothold within both SMBs and large enterprises alike. The recent acquisitions by Gartner in this space of Capterra, Software Advice and GetApp shows that even the large traditional IT bellwethers are not immune to getting in on the action and spending big money to hedge their bets. The major industry shifts occurring right underneath them, namely, the democratization of software vendor reviews for enterprises and the corresponding commoditization of expert market analysis, are not lost on them. The primary cause for technology selection management turning into a brisk B2C-style process is the fact that as much as 40% of technology selections are business-led rather than IT-led. And with the proliferation of cloud-based software vendors and user-friendly, self-service signup portals, this number is expected to double within the next two years! Soon enough, almost all software purchases will be done by actual end-users and lines of business with IT being a participant that seemingly “checks the boxes” rather than leading the charge on requirements gathering, vendor short-listing and technical due-diligence. Other recent articles have covered how IT and IT Procurement specialists can bring strategic value in spite of this changing landscape, so I won’t delve into that. Instead I will focus on how anybody, regardless of whether they are a sophisticated Enterprise Architect, an IT Sourcing veteran, or your average end-user, can adopt an agile technology selection management (TSM) model to attain a more successful outcome for themselves and their organizations. Agility and speed do not have to lead to a bad outcome when it comes to IT vendor selections. 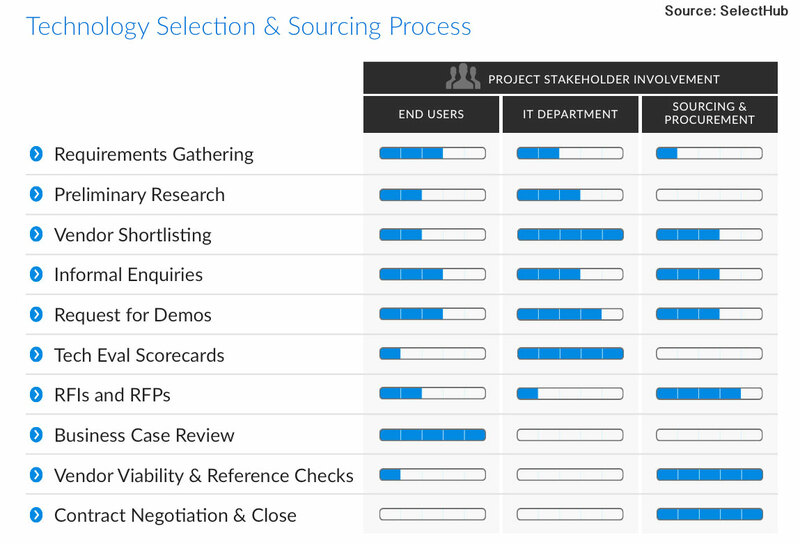 So what is Technology Selection Management? TSM is a newer but fast-evolving model, best visualized as a prescriptive workflow with relevant process steps as laid out in Figure A, and layered with context-based IT selection market intelligence such as requirements templates and vendor leaderboards. The latter expert-level resources help to accelerate the overall selection timelines. For example, if an organization is starting to compile requirements for a new CRM solution, rather than reading through a generic CRM news article or sorting through disparate pieces of marketing collateral from a vendor website, a pre-vetted CRM “requirements template” representing industry best practices could be provided to project stakeholders helping to jumpstart the requirements definition phase. Additional requirements addressing that organization’s security and compliance needs could automatically be merged in, representing the voice of their IT Security team. Regardless of whether an organization is making a small or a large IT purchase, TSM enables relevant stakeholders to come together and follow bite-sized process steps to achieve an objective, informed and consensus-driven purchasing decision. The specific process steps can be based on criteria such as project budget size, scope and sponsorship or even broader aspects such as organizational policies and compliance needs. A key benefit is that a successful purchase of a new IT product or service can be achieved by end-users directly, without active IT or Procurement oversight. TSM complements the typical static Service Catalog of pre-selected products and services by applying a similar notion towards evaluation and purchase of newer offerings from vendors that do not possess any pre-negotiated relationships with the organization. At the same time, TSM provides control groups such as IT or Finance the governance and oversight they seek, but without them becoming a bottleneck, thereby eliminating the routine red tape that motivates stakeholders to bypass the procurement process and engage in rogue or shadow IT practices. The above control groups can pre-configure the TSM workflow such that stakeholders cannot inadvertently bypass relevant security and compliance-related safeguards such as initiating untimely communications with a vendor that could be construed as giving them preferential treatment during an RFP process. Easy governance and transparency are key elements of the model, but so are ease-of-use, self-service and speed for end-users. The traditional IT sourcing and procurement process within enterprises is often viewed as being too rigid, laborious and slow – it comprises a multitude of rules without a clear rationale of corresponding value to participants. Furthermore, the manual administration of the process and lack of intuitive controls makes it far too easy for end-users to get themselves and their organization in trouble. A large number of cloud-based software offerings have come into existence over the past 5 years attempting to inject increased productivity across scores of business functions. Every month, there are dozens, even hundreds of startups and open-source solutions being launched. 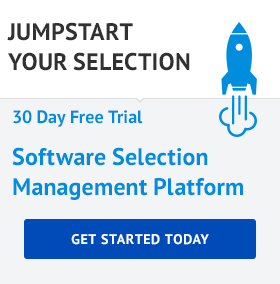 Here’s an example of this eco-system for marketing departments and the staggering array of choices one faces when selecting a marketing automation toolset. It is no secret that end-users are increasingly making decentralized technology decisions, and funding IT product and service purchases via their own budget in the form of monthly Op-Ex spend. So how are they selecting these products and vendors? Organizations have traditionally engaged third-party consultants to review requirements and recommend solutions, but that’s an expensive proposition and typically costs tens, even hundreds of thousands of dollars. That is justifiable for larger projects especially when an “insurance policy” is needed in the form of a reputable consultant. Analyst research reports that describe IT market landscapes are also often leveraged by organizations. However these research reports are also relatively expensive and they tend to be fairly technical since they often target sophisticated IT stakeholders rather than genuine end-users. Moreover, they lag behind in terms of vendor and product coverage. Far too often, smaller vendors and open-source solutions are conspicuously absent. Finally, these reports offer “generic content” at best – in other words, vendors and products are not categorized based on the end-user’s specific requirements. It doesn’t help end-users to know there are a hundred vendors in a given space unless there’s also an easy way to tell which ones are especially relevant to their organization. The latter question is precisely what an array of startups have been attempting to address over the recent past by compiling peer users’ collective wisdom into a Yelp-style reviews database. Their goal is to make selecting business technology as easy as choosing consumer products. Unfortunately, while the intention of harnessing word-of-mouth is noble, a lot of the reviews are unstructured, incomplete and superficial. Hence when a company needs to understand vendor capabilities in more depth, these community user reviews offer limited recourse. There are also the twin issues of review legitimacy and bias. Although these startups are somewhat addressing the former via a multi-touch authentication system (e.g., only permitting reviewer registrations via Linkedin, manual audits of reviews, etc. ), bias may be harder to get rid of. This is due to an interesting side-effect of how many review sites obtain growth. They sign up vendors positioning themselves as being a “custodian” of their community presence and ask the vendors themselves for customer and user references. Obviously, vendors are inclined to offer up customer names that will provide favorable reviews.  Additionally, many enterprise users are far too busy and cannot be bothered to provide negative reviews publicly especially in the light of strict corporate policies meant to avoid unnecessary legal liabilities. Regardless, reviews from these customers are solicited via seemingly innocuous gifts such as Amazon gift cards. Much of this can lead to prejudice, as well as increase the possibility of illegitimate reviews from users. The lure of a gift-card can be strong enough to produce “real users” that just happen to never have used the software they are reviewing. All said and done, reviews serve a useful purpose, but used in isolation, they can do more harm than good. All the trappings of flock mentality creeps in where buyers and end-users do not get the full picture and remain unsure whether short-listed products will actually meet their expectations or not, wasting valuable company time and resources on sub-optimal decisions. And they are certainly not a replacement for the well-vetted RFI / RFP model in terms of mapping granular requirements to vendor capabilities most effectively and accurately, with the corresponding audit-trial and vendor accountability. The need of the hour becomes an agile, reliable and prescriptive technology selection workflow where the inherent benefits of the RFI/RFP process can be obtained without sacrificing speed or quality of decisions. That’s where TSM comes in. With TSM, the emphasis is on technology selection rather than traditional sourcing. That means, a pragmatic, more end-user-focused approach that allows both IT and Procurement personnel to deliver more value during all phases of the process thereby motivating end-users to involve them early on. If the TSM model is set up right, these groups can remain behind the scenes stepping in when necessary and dealing with exceptions, while delivering tangible value to end-users, with the peace-of-mind that the right process is indeed being followed. Venkat S. Devraj is co-founder and CEO of SelectHub. Venkat was formerly Chief Architect, Cloud Automation and CTO, Application Automation at Hewlett Packard. He came to HP when they acquired the previous company he had co-founded, Stratavia. He is also the author of “Oracle 24×7 Tips and Techniques” and co-author of “Oracle8i Web Development” (both from Osborne / McGraw-Hill). He holds two patents in IT process automation. Over the past 23 years, Venkat has seen both the buyer and vendor side of technology selection projects and is passionate about streamlining and improving this process.